Satin is a type of textile weave that makes fabric look shiny and glossy. Though this method is most classically used with silk thread, it can also be used with other materials like polyester, acetate, nylon, and rayon. There are several different variations on this weave, notably sateen.Similar to silk, it reflects light from all angles, most likely more so because it is a very shiny material. It can be very hard to hand as a scarf and would definitely require a underscarve beneath it to hold it in place. Most girls tend to wear these Hijabs on a special occasion or weddings as it is very luxurious and can be eye catchy! 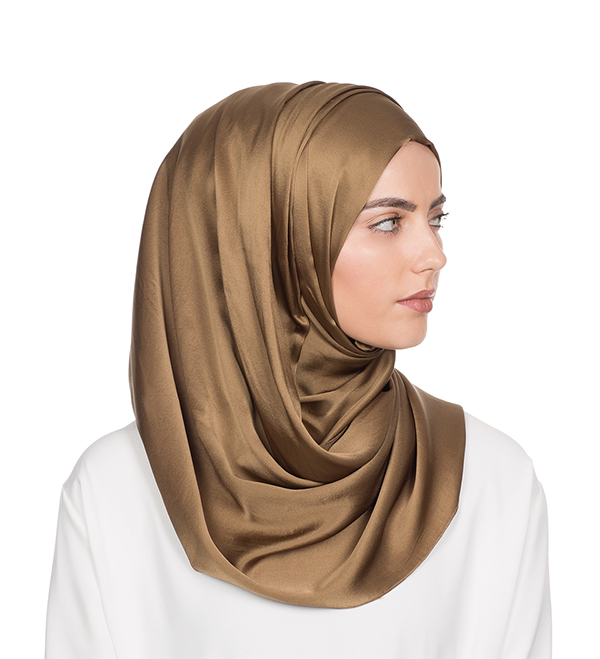 Every hijabi knows the dilemma, when you have a lovely occasional gown to wear, but pairing the right hijab, worthy of the outfit is not an easy task. Satin Hijabs makes this very difficult task easy. Beautifully light and breathable with a silk sheen, they come in a variety of colours to fit in with your needs. A little history in satin, originally, during the Middle Ages, satin was made of silk; making it a very expensive fabric to obtain and was only used by the upper classes. Satin then went onto become famous in Europe during the twelfth century. The name derives its origin from the Chinese port city of Quanzhou, whose name in (medieval) Arabic was Zayton. During the latter part of the Middle Ages, it was a major shipping port of silk, using the maritime Silk Road to reach Europe.